Is there any way for the Fed to get out of QE forever? As Americans for Limited Government economic analysis had previously predicted — here, here, and here — there would be no tapering from the Federal Reserve’s $85 billion of quantitative easing anytime soon. Defying market expectations that the central bank would announce its exit strategy from its policy footing, on Sept. 18 the Fed said it had “decided to await more evidence that progress will be sustained before adjusting the pace of its purchases.” In addition, it said it would keep the Federal Funds Rate near zero percent. In short, the economy is still very weak, and the Fed at least for now believes growth cannot endure without its purchases of $45 billion of treasuries and $40 billion of mortgage-backed securities every single month with money created out of thin air. It’s an extremely bearish indicator. Likely weighing on the Fed’s consideration are rising interest rates, cooling in the housing market, continued weakness in Europe, and an implosion in emerging markets, particularly the popping of the credit bubble in China — all bad signs for the global economy going forward. Plus, continued deleveraging the nation’s financial sector, which shed another $15 billion in debt in the first quarter. At the same time, the Fed released its economic projections for the remainder of 2013, where it sees just 2 to 2.3 percent growth in real Gross Domestic Product for the year. That, even as the economy is only growing at a 1.8 percent annualized rate this year so far. But even if the Fed is right about the remainder of the year, 2 to 2.3 percent growth is nothing to write home about. Similarly, the Fed sees unemployment remaining above 7 percent through the end of the year. So, how did markets react to all this bad news? Why a massive rally, of course! The Dow Jones Industrial average jumped up 147 points. 10-year treasuries interest rates dropped 15 basis points. Gold rallied by $54 as a hedge against expected inflation from the Fed’s pump priming. 1) More debt monetization by the federal government, which continues to have a willing buyer for its unbridled spending sprees. 2) It allows foreign governments to continue to dump U.S. treasuries for profit. From the end of March through July, foreigners dumped $131.7 billion of U.S. debt after increasing assets for 15 months straight, according to data compiled by the U.S. Department of Treasury. These four months mark the largest drop in foreign holdings of treasuries on record, detailed monthly Treasury data going back to the year 2000 reveals. 3) It helps banks to continue to sell junky mortgage-backed securities for 100 pennies on the dollar. 4) In a similar vein, banks will continue to stockpile the QE cash as reserves in excess of statutory requirements, which have swollen by $226.7 billion since June alone to now $2.17 trillion. 5) Overall, it’s just another bailout for governments the world over, the housing market, bond investors, and other Wall Street bigwigs. All of which means one thing. 5 years of unprecedented money printing by Bernanke have failed. The Fed has increased its balance sheet by $2.8 trillion since the financial crisis began in the summer of 2007, all to no avail. Most of it is sitting in a vault, doing nothing to boost the economy. Japan is a textbook example of the futility of such “stimulus”. Where, regardless of how easy its monetary policy is, or how low interest rates are pushed down by the central bank (10-year Japanese government bonds now yield a cool 0.67 percent interest rate), or how large the debt gets (it’s well north of 200 percent of GDP), it is still a zombie. After Japan’s real estate market crashed in 1989, it experienced a lost decade that it still has not recovered from. That’s where the U.S. is now, where, rather than allowing credit markets to contract in the wake of the financial crisis, the Fed sought to paper it over with bank bailouts, in the process prolonging the pain. We would have been better off had the Fed did nothing. Markets would have found their bottom rapidly, and a real recovery would already be underway. 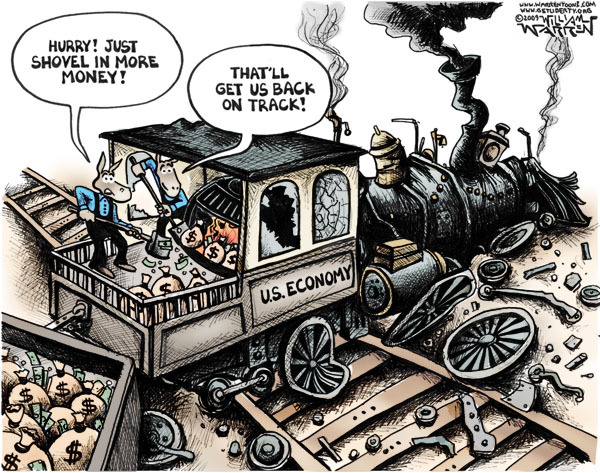 Instead, the economy remains off track, with Bernanke and company still convinced that shoveling billions of more dollars into the engine will somehow get us moving. But don’t hold your breath for a robust recovery. In the meantime, one can only hope that Barack Obama is paying attention and might reconsider a status quo appointment to replace Bernanke as Federal Reserve chair. But somehow, we doubt it. If he is replaced with another dove, like diamonds, QE will be forever.